This collective book is about the role of Indian thinkers as actors who preserved pre-Columbian knowledge within the new social order and recreated it to enforce or contest Spanish imperial rule. 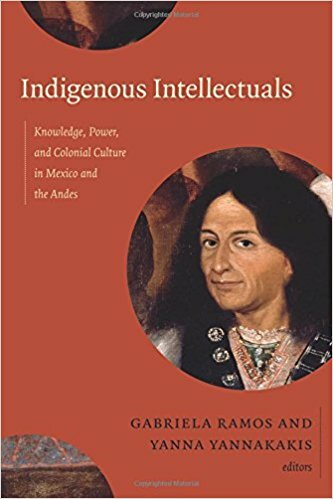 The book editors integrated several essays of top historians that explain how indigenous intellectuals in the colonial Andes and Mexico were important for the success of both the Spanish authorities and Indian elites in reaching political power and legitimacy. Together, the book’s articles offers a comparative perspective of colonial Mexico and Peru focusing on the indigenous scholars’ lives, productions, and epistemological networks. This comparative analysis shows that knowledge production was more culturally and linguistically diverse in Mexico than in the Andes. On the one hand, Spanish prevailed on the Quechua as the principal written medium. This meant the indigenous people of the Andes had to learn a new foreign language to achieve social mobility and the Spanish government could centralize more rapidly its political power in the Andean region. On the other hand, in colonial Peru, Spanish rule gradually marginalized the Inca quipu system –records expressed with numerical terms while in colonial Mexico the Mesoamerican pictographic writing tradition –codex with images and words that recorded all kind of information– rapidly adapted the Castilian alphabet scripture. This exemplifies how the Spaniards were reluctant to utilize the numerical system of the Inca people while they accepted the continuity of the Mesoamerican tradition of communicating whole ideas by combining images and words. In her contribution, Gabriela Ramos suggests that the former centralized power of the Inca empire limited knowledge to very few hands while in Mexico the fragmented structure of the Aztec empire allowed a linguistic diversity that survived Spanish colonization. Ramos explains how the indigenous language, Quechua, became the lingua franca in colonial Cusco and Lima., The standardization of one language allowed the Spaniards to exert control more effectively, but also allowed natives to use the legal culture to their own benefit. The essays also explain how indigenous intellectuals used their ancient knowledge to transform and thus critique, resist, or accommodate with the colonial system. Religious orders played an important role in the critique of power through evangelizing and educating the natives. John Charles addresses this in his study of Jesuit colleges in the colonial Andes. He demonstrates that Jesuit schooling allowed young indigenous nobles to learn the Spanish law and language to protect local self-rule and their family’s interests and investments. Andean nobles who were schooled by Jesuits did not hesitate to confront corrupt Spanish authorities using their knowledge in the litigation process. Alan Durston offers another example of resistance by Indians thinkers. He analyzes the Huarochirí Manuscript (Quechua language text that describes the traditions and myths of the natives of pre-Columbian Peru) to explain how an indigenous intellectual and nobleman prioritized local indigenous traditions that expressed historical narratives through ancient Inca myths, the huaca tales. Durston shows that indigenous writers chose to preserve their ancient records instead of embracing completely Europeans forms of knowledge. Concerning the issue of the political adaptation of Indians to the colonial system, María Elena Martínez provides one of the most compelling aspects of the book, a study of the political functions of Indian genealogies in central Mexico and Peru. Martínez shows that genealogical narratives empowered Indian noblemen in both regions by adapting ancient traditions to understanding the Spanish conquest as a pact of vassalage with the Spanish crown. During the 17-18th centuries, indigenous intellectuals created a great variety of títulos primordiales (Titles of land in colonial Mexico referring both to the pre-Columbian and colonial periods) and visual representations of dynasties (Peru) to retain or gain privileges from the crown. Those genealogical narratives shows that natives elites in colonial Peru conceived of Spanish rule as a peaceful and voluntary transfer of power between the Indians and the Spanish crown, not as a military conquest. All the authors in this collection have a clear and concise writing style and use a wide range of primary sources: chronicles, confesionarios, trial records, lawsuits, petitions, contemporaneous histories, photographic representations that combines European and Indian forms of knowledge, and so forth. Particularly, the authors show how the analysis of chronicles and histories shed light on the intellectuals’ networks and the role of Indian scholars in preserving the oral memory of native societies that today are not well known. For instance, John F. Schwaller examined the productions of the brothers Fernando de Alva Ixtlixochitl and Bartolomé de Alva. The first served to interpret and translate the native history into models that were understood by the Spanish rulers while the second used his wide knowledge of native religious practices to enforce a better Christianization. For her part, Camila Townsend shows that Nahua historian Don Juan Zapata and other Nahua historians claimed to be the responsible for preserving their communities’ memories. The essays of Schwaller and Towsend also are also remarkable as they include an insightful analysis of the Nahuátl language. Yanna Yannakakis examined the translation process for understanding the relationship between indigenous people and the legal system. She argues that translation practices in colonial Mexico led to a process of commensuration, that is, the Spanish and native languages established a common ground so that Christianity could become comprehensible both for Spaniards and indigenous communities. She demonstrates how the Zapotec language integrated the Christian notion of sin to create a discourse on criminality, which the Indian elites then used to dispute colonial power. This collection of essays draws attention to the importance of intellectuals in the construction of alternative ways to achieve power and social mobility. The Indian intellectuals of colonial Mexico and the Andes demonstrated the validity of the common idea that “knowledge is power.” And it is power because it offers a pathway to contest or to improve the ways that people interact with their rulers.